Don’t wear “clothes that poke eye” and remember the “Mongoose fight” uniform for official functions. These are some of the funny English translation errors in the website of Malaysia’s Ministry of Defense which made headlines last week. The errors have been removed already but not before netizens were able to discuss them thoroughly in various social networks. The dress code says officers and staff must wear “ethical clothing” — but at the same time “the dress code is not allowed in the work”. 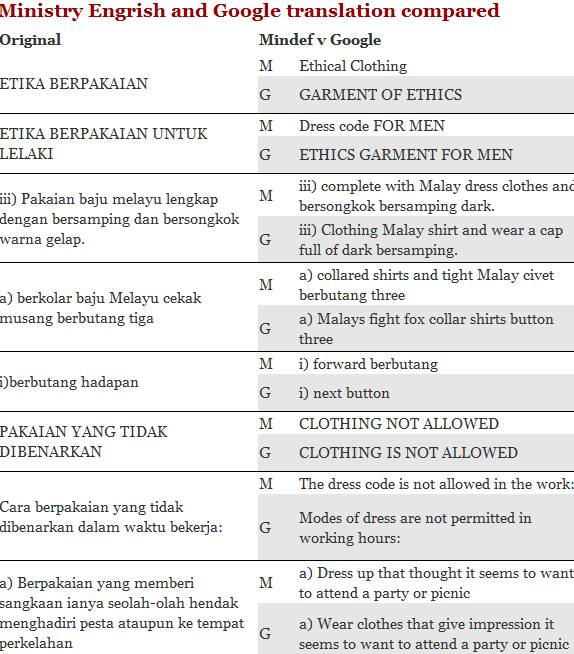 “Ethical clothing” was required (although there was no code of ethics that the clothes must follow). However, the clothes must not be party-going or picnic-going types. Every Thursday is “mongoose fight” day for those not in uniform. “Mongoose fight” clothing is also for attending “official functions that do not require the use of certain types of clothing”. The “clothes that poke eye” is a literal translation of pakaian yang menjolok mata, which means revealing clothes in Bahasa Malaysia. Another error which made many people laugh: “After the withdrawal of British army, the Malaysian Government take drastic measures to increase the level of any national security threat”. It’s bad enough that statements by the defence minister himself are much of a joke, but the dress code translation is hilarious. This table consists of a few examples. Was Google at fault, or the ministry? Was the defence minister telling the truth, or trying to pass blame to others? When a govt lies about a small thing, can you trust them with big things? Apologists for politicians always make excuses to say the politician was misinformed. Just because someone lied to him and he in turn lies to the public does not excuse the lie. Ministers are responsible to the public for the conduct of their ministries. If a civil servant lied, he is disciplined. But it is the minister who takes the rap in public. That’s how constitutional democracy works. Minister Ahmad Zahid Hamidi should learn quickly that not everything can be ‘automated’. Language is not one of them. The minister should review his ministry's recruitment process and employ those who are really proficient in the English language or the very least employ those who can show some initiative to do any task right. Yes, this is very embarrassing not only to Mindef but also to the government. I am personally aware of the Malaysian Ministry of Defence (Mindef) using Mangrish (Malaysian mangled English) on its website, as I had on a couple of occasions accessed it for some information, only to encounter such horrors. They would be better off sticking to only Bahasa. Please lah – don’t take us for idiots! Even if you use Google Translate – any person with average intelligence knows that it shouldn’t be used directly. It is important to fathom the linguistic context; otherwise you get phrases like the ones highlighted above! What’s more, you can still spot the errors before you upload the translated script onto the website – if you do actually check and double-check, that is. Unless, of course, you are asleep on the job. The question that simply begs to be asked is this : Why in God's name did the Ministry of Defence use Google Translate when they had the Institut Penterjemahan Negara at their disposal? Can't our Defense Ministry afford to pay for a translator instead of using Google Translate? Of all purposes and intent to ‘save’ public money they pick the one that they are least proficient at.